Many factors can affect the true efficiency of your irrigation system. But perhaps the most overlooked factor is the ability of water to move in your soil. Water is the driving force behind turf health and growth. Therefore, it is vitally important to get water into the soil uniformly for consistent turf performance. Water repellency — even at low levels — can prevent water from penetrating properly. 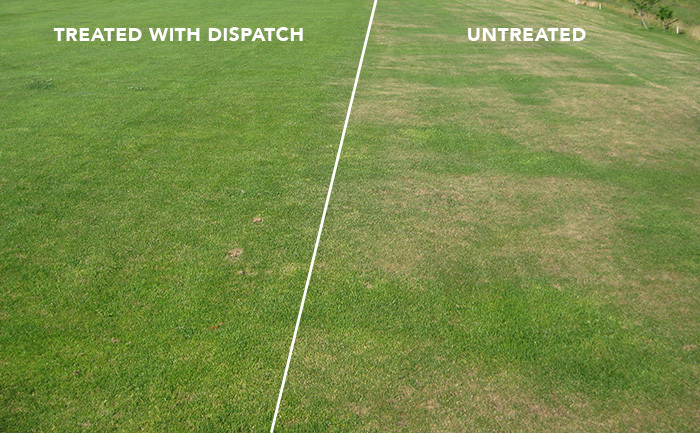 Dispatch® is a patented soil surfactant technology that maximizes irrigation efficiency, allowing you to grow healthy turf while saving water and energy. Dispatch is available in two convenient formulations. The 17% Dispatch Injectable formulation was created because a higher active ingredient (AI) is too viscous to pump and inject through irrigation systems. This injectable formulation was specially designed to maximize irrigation results. For those who cannot inject or prefer spray applications, the 51% Dispatch Sprayable formulation was created with a higher AI for spraying and mixing convenience. There is less volume to handle and fewer containers. It is also tank mix compatible with most fertilizers and other inputs. Dispatch Injectable: Inject 12-24 ounces per acre on a weekly basis. For problem soils or during extreme drought conditions, Dispatch Injectable may be injected up to 48 ounces per acre per week. Spray 8 ounces per acre once a week. Tank mixing Rate: For one time application with soil-directed turf chemicals, apply at 16 ounces per acre. Dispatch takes over where irrigation systems leave off. Dispatch is a patented synergy technology that is scientifically proven to enhance soil wetting, improve infiltration, reduce leaching, and enhance fertilizer efficiency. It reduces wet spots in low turf areas and hot spots on higher turf areas and slopes. Dispatch is more than just a penetrant. It offers turf managers the comfort of true irrigation efficiency, taking over where high efficiency irrigation systems leave off.